POWER OF THE WORLD'S LARGEST CIRCULATION TO BUYERS. 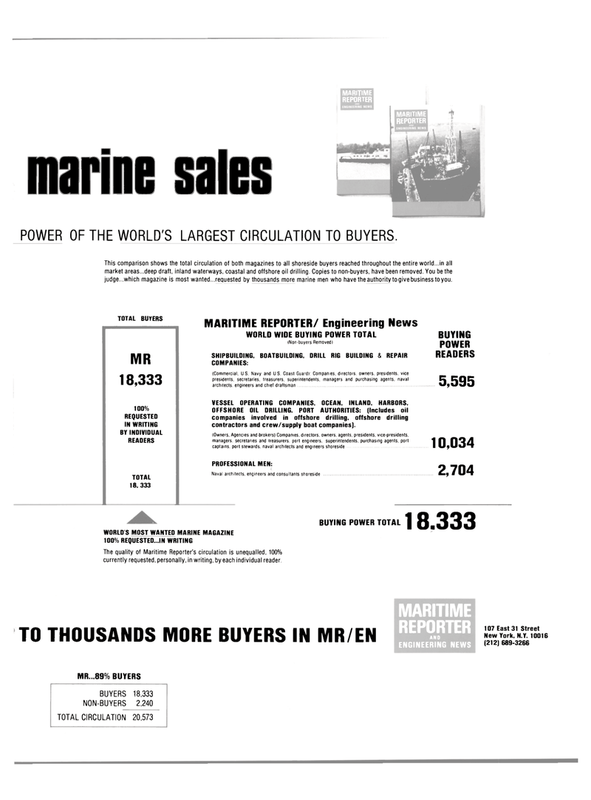 This comparison shows the total circulation of both magazines to all shoreside buyers reached throughout the entire world...in all market areas...deep draft, inland waterways, coastal and offshore oil drilling. Copies to non-buyers, have been removed. You be the judge...which magazine is most wanted...requested by thousands more marine men who have the authority to give business to you. VESSEL OPERATING COMPANIES. OCEAN. INLAND. HARBORS. The quality of Maritime Reporter's circulation is unequalled, 100% currently requested, personally, in writing, by each individual reader.